Contents:1 Guidance Leaflet, 60 Assorted Washproof Plasters, 6 Standard Dressings-Eyepad, 12 Standard Dressings-Medium, 4 Standard Dressings-Large, 8 Triangular Bandage, 20 Alcohol Free Wipes, 24 Safety Pins, 3 Pairs of Disposable Gloves. 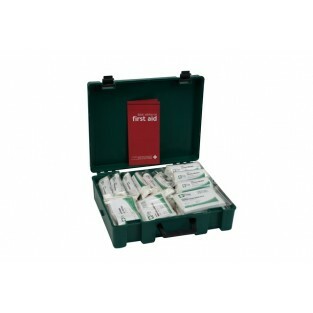 Comprehensively stocked and compliant with the Health and Safety Approved Code and Practice in a durable polypropylene case. Suitable for up to 50 employees.